Bakersfield – Get Your Pool Ready In Time… | The Best Pool Service in Bakersfield?? Summertime is the best time of the year. You can make every minute of the summer count by having your very own pool party. Whether you are thinking about a refreshing dip to make the heat more bearable, or as a great way to entertain your friends, nothing could be better. However, a fun and safe swimming pool experience starts with a clean pool and fresh water. Bigbluepools-bakersfield will get your pool completely prepared for your summertime fun. First, the overall condition of the pool itself creates a safe atmosphere for guests, especially kids. As pools tend to accumulate slippery film and other residue if neglected, safety means that this must be removed before you and your guests use the pool. When your pool is spotlessly clean, you will not have to worry about guests sliding and having an accident. Even young children, when supervised properly, can safely enjoy swimming and playing. There will be no slick tiles or surfaces inside for children and others to slip on. Everyone can focus on having fun. Second, the water has to be kept fresh and pure. Not only does this mean ensuring that dirt and bacteria are removed, it also means keeping chlorine or other purifiers at the appropriate level. When the water is in its best condition, it is safe for one’s hair, skin, and eyes. No matter how much time you spend swimming, you are assured of a healthy environment. You can make every weekend a party, and every evening after work a time of enjoyment. Sparkling fresh water makes the entire experience even more appealing. Your back yard itself will be more attractive and inviting. Having a pool cleaned on a regular basis means a summertime of refreshing, healthy, safe fun. If you have ever used a public or private pool that was not kept up regularly, you already know that it can be more than bothersome. You may have tried to deal with pool maintenance yourself, and found that it required too much time, or skills that the average person does not have. Put an end to these problems once and for all. When you have a skilled, experienced service to clean your swimming pool, you know that you have found quality workmanship from a company who cares. All there will be left for you to do is invite your friends, and be prepared for the most refreshing summertime swimming experiences that you have ever had. 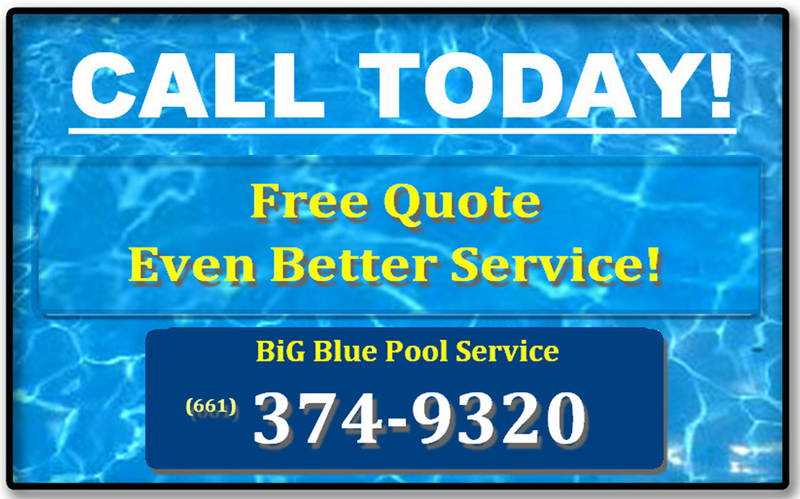 Big Blue Pools in Bakersfield will serve your every pool maintenance need!